A research team headed by Prof. Dr. Frank Stienkemeier and Dr. Lukas Bruder of the University of Freiburg's Institute of Physics has applied 2-D spectroscopy to isolated molecular systems for the first time, and thus in tracing the interactive processes at a molecular level more precisely. The team has published its results in the science journal Nature Communications. Processes at atomic and molecular levels often take place on very short time scales, faster than a billionth of a second, and are based on the interplay of many factors. Until now, this has made it difficult to decrypt the precise microscopic mechanisms such as the conversion of energy in photovoltaics or photosynthesis. 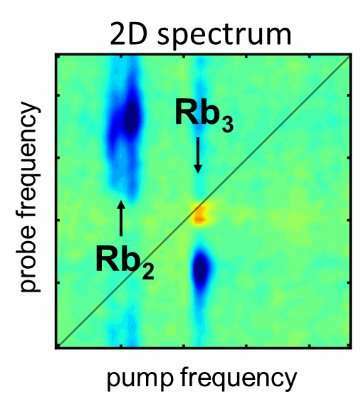 Coherent two-dimensional spectroscopy involves ultra-short laser pulses shot at a material. This method has enabled researchers to follow the dynamics of such processes. Two-dimensional spectroscopy provides a far greater amount of information than other methods, combined with a high time resolution in the range of femtoseconds, the millionth part of a billionth of a second. However, for technical reasons, this method had previously been restricted to studying bulk liquid or solid material. "In previous experiments, the samples were very complex, which made it extremely difficult to isolate individual quantum-mechanical effects and study them precisely. Our approach overcomes this hurdle," explains Bruder, who headed the experiment. In preparation for the experiment, the scientists produced superfluid helium droplets, which have no friction, in an ultrahigh vacuum. The droplets are only a few nanometers in size and serve as a substrate in which the researchers synthesize the actual molecular structures using a modular principle—in other words, by combining molecular components one by one. These structures are then studied by means of 2-D spectroscopy. "In the experiments, we combined various specific technologies that drastically improved the measurement sensitivity of the 2-D spectroscopy. By doing this, it was it possible for us to study isolated molecules," explains Bruder. In an initial study, the Freiburg scientists produced extremely cold molecules of the chemical element Rubidium in an unusual quantum state, whereby the atoms of the molecule are only weakly bonded, and analyzed their light-induced reactions under the influence of the helium environment. "Our approach opens up a range of applications, specifically in the field of photovoltaics or optoelectronics, and will eventually contribute to a better understanding of fundamental processes," says Stienkemeier.